Take a tired old Britains toy tractor and turn it into something special with a few add-ons or completely customise it to your liking. This can include anything from a weathered effect or pop a driver into the cab, often its only the simplest suggestion that adds real value. Opening a brand new Britains tractor straight out of the box is an enjoyable experience, played with for years to come. And hopefully until the young one grows up and passes it down to a sibling or a friend for it to be enjoyed for many more years. But during the stages of growth the child are bound to move away from that once cherished Britains tractor and take up something new. In an effort to revitalise their Britains tractor, we've put together a few ideas in a way of customising the tractor to give it a new lease and life. You can get any child interested in toy tractors again simply by making it a one of a kind customised tractor. We've made a few inspiring ideas for your below for you to ponder over, but be sure to consider making the changes to the tractor, re-boxing it before giving it to your own child or a friends as a birthday present or special gift. 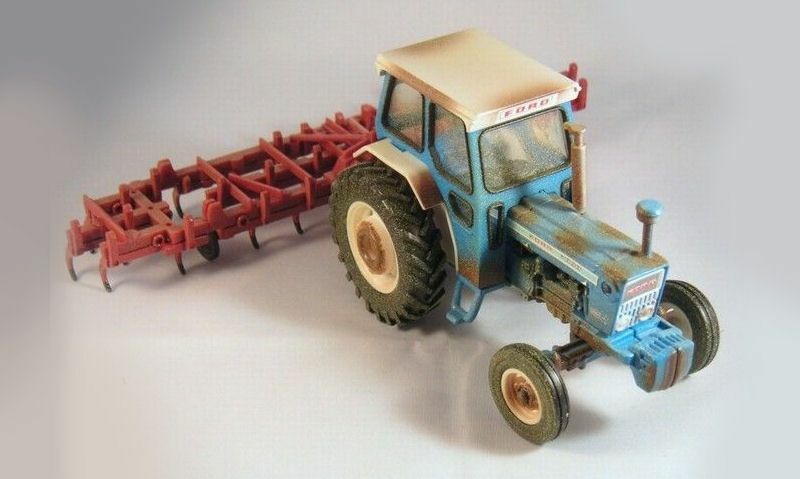 Thankfully, you can buy yourself an already weathered effect Britains tractor - off-the-shelve. Go to a known farm toy shop and they should have a section dedicated to weathered models. But if you can't find a model to your liking you can get one customised for a fee. Having a specialist carrying out the work for you does cost extra with commission, so expect a tractor retailing at £15.00 to cost double or even triple that. But remember you're saving on paints, brushes and other costly materials. If you're thinking about customising your own Britains tractor, the prospect is exciting with lots of new skills to pick up along the way. We favour heavy weathered in a muddy setting, so the body and wheels and are caked in wet effect mud. But other options include snow, light dusting with extras like rust. Back in the day you could buy Britains tractors with a figure in the cab, but these days that extra realism is missing in all Britains tractors as the seat is left empty. Its not a major deal to most kids but how excited will they be with a driver behind the wheel with no other toy tractor of it's kind like it. To complete your project you will need a set of of Siku tractor driver figures in the four or double set option. This is an adult project so surprise the little one when your done. Previously, we suggested a whole bunch of ways you could fix a tractor driver inside the cabin of a Britains 1:32 scale tractor - but times have changed. Britains released a set of tractor driving figures that are compatible with all figure tractor releases - well they're not unfortunately back compatible. To fix the driver in the cab, simply remove the cabin off the body and sit in the driver. It should stick to the seat tightly, but if it doesn't why not go out and get a roll of double-sided sticky tape - the strong carpet kind, not the weak arts and crafts type. Producers of model tractors will introduce a special edition or limited edition tractor with a striking finish - usually painted in silver. If you fancy that with your own colour, all you need is a pot of your favourite Humbrol paint and - if you don't already have one - an airbrush kit to produce a clean, brush-free finish. An airbrush kit will set you back - RRP £50.00 complete - not forgetting the practice you'll need before working on your project. So if you don't already have an airbrush set, the investment is really not worth it. If you plan to carry out weathering effects as mentioned above, then go ahead and invest in your new hobby. If you haven't already a matching trailer to go with your tractor will bring a whole new life to the young farmers play. No longer will they be driving around the yard with little to do, but now they have a purpose with the need to fill up the trailer with bits and pieces. But from a educational aspect, they now learn about tractor trailers and how each trailer serves a purpose on the farm. Like muck spreaders and balers or simply a flatbed for moving bales of hay. Match up your trailer in the same colour as the tractor to make the perfect tractor and trailer set. Look to Britains farm toys 1:32 scale for a huge selection, well Britains also have a nice, smaller selection of Big Farm trailers that will also fix to Bruder tractor. It might seem like an obvious choice but something like a front loader will make the world of difference, with a up/down movement and pivoting bucket. Now the young farmer can pick up sand, gravel and dirt and make piles, or fill up a trailer. We do recommend you buy a Britains tractor with front loader attachment already fitted. Fitting a front loader and making it function on the 1:32 scale tractor is near impossible for most, plus Britains don't' currently sell front loaders separately. But if you're the owner of a Britains Big Farm tractor you can buy all sorts of attachments including a functioning front loader with tipping bucket.